Saltrice is an ingredient used in Provisioning to make a variety of Food dishes. As a medium-type ingredient, it is used in a wide variety of foods. All but the most basic recipes and Gourmet recipes will use a medium of some type. 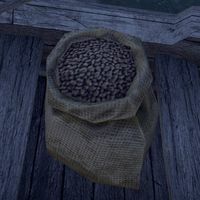 Saltrice may be found in containers throughout Tamriel, most easily in Saltrice Sacks. Meat Dishes have an Increase Maximum Health effect. Fruit Dishes have an Increase Maximum Magicka effect. Vegetable Dishes have an Increase Maximum Stamina effect. Savory Dishes involve Meat and Fruit, and increase both Health and Magicka maximums. Ragout Dishes involve Meat and Vegetables, and increase both Health and Stamina maximums. Entremet Dishes involve Fruit and Vegetables, and increase both Magicka and Stamina maximums. This page was last modified on 4 January 2018, at 23:53.